So i have not been blogging for a whole month! What have i been up to? Well, it was the summer school holidays and as is our custom, we went to Singapore to visit family and friends and of course to pig out on all that delicious food – hmmm… yum! 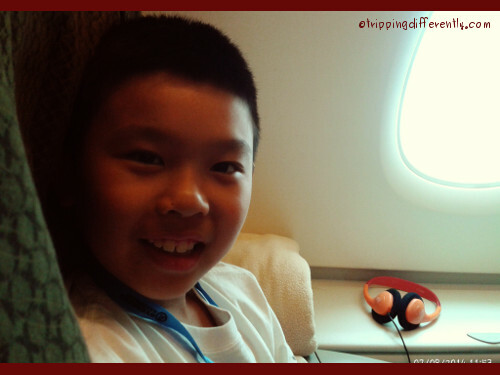 We set off on a jet plane – SQ A380 – we managed to get seats on the upper deck this time! Lots better than lower deck for us because we could get a window seat with just an aisle seat next to it. Yep a 2-in-a-row 😉 Which meant we could be a bit freer with our use of space. Plus the seat we chose had extra side storage – score! Of course the person who really scored was my dear husband, who got upgraded to business class because economy was so packed! They couldn’t upgrade the boy and i cos we don’t travel enough, even though there were seats in business. But it’s okay. We got to be on the same deck (our original seat allocations put us on 2 different decks). We enjoyed looking at old places which have been refurbished and given new life. 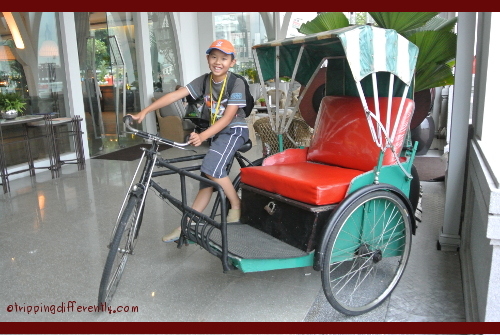 Riding a rickshaw at The Clifford Pier, which was the jetty where most people landed coming into Singapore in the 50s and 60s… Now it’s a fancy hotel and restaurant. 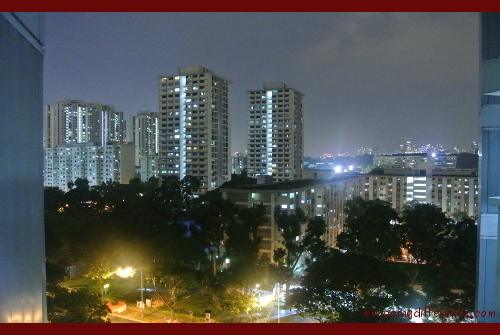 Exploring a new neighbourhood became a must because my in-laws moved to a new, smaller flat. 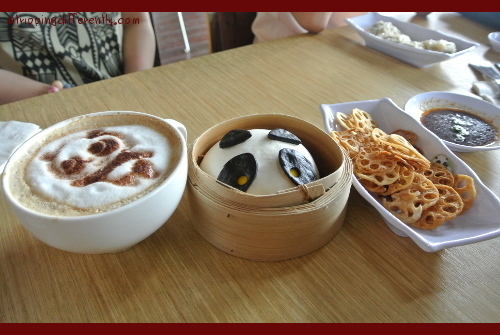 But it is in a more convenient location, nearer downtown and has fantastic food just across the street! 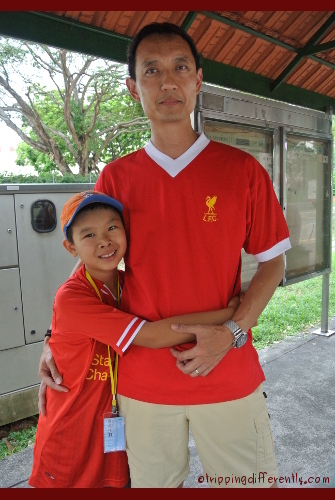 And we painted the town red – see the boys in their matching outfits? Another place we explored was Labrabor Nature Reserve – another place which has been given a new lease of life. It was nice to walk around the park and get an ocean-view as well. 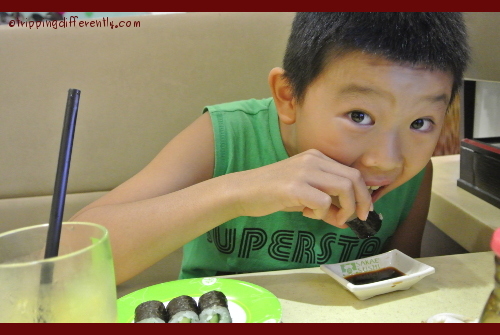 No trip would be complete without our little sushi monster getting his fill of his favourite food – Sushi! Actually this time round we did end up at a place where he didn’t like the sushi. It wasn’t terrible, just very limited in choices and it didn’t seem too fresh. Of course the major minus was they didn’t serve his favourite maki pieces. He absolutely loves his sushi! 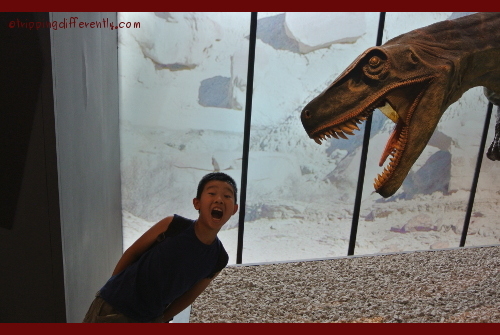 From eating to getting eaten – well, almost… hehhee 😉 We visited the Dinosaurs Exhibition, From Dawn to Extinction at the Art Science Museum. Very impressive and quite fun, especially if you download the app and play along. Time with family was the important thing – Tobias got to play football with his cousins. 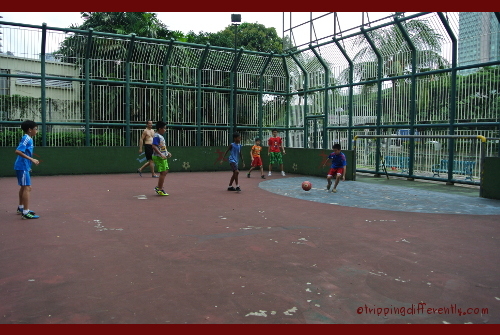 They played a few games with the boys who were already there as well as another team of middle-aged guys who came later. This trip we did not do much touristy stuff. 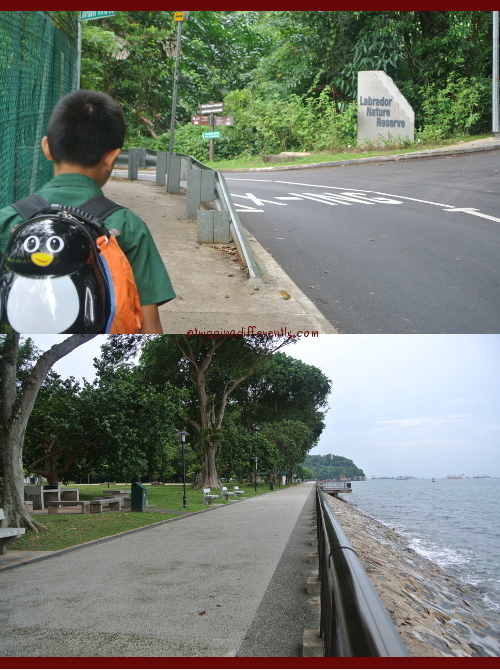 We did go to the River Safari – again. This time because we had complimentary tickets and we wanted to try out the Amazon River Ride which was not opened last year. It was just okay – a little too fast to catch sight of all the animals. Also it rained and rained and we almost did not get to ride the boat. So we looked at fish. Then we went to feed the fish. We tried out a fish spa, where you go and let little cleaner fish feed on the dead skin on your feet. Apparently very good for skin and blood circulation. The guy at the second place (we bought a package of 6 visits) told us that they used to provide full body, not just feet. But due to space constrains and the lack of interest (and i’m sure the cost of keep much bigger tanks of fish), they now only offer feet services. The only other touristy thing we did was visit the Science Center. Some parts of it was interesting and other parts not so. Quite a number of exhibits didn’t work too well. 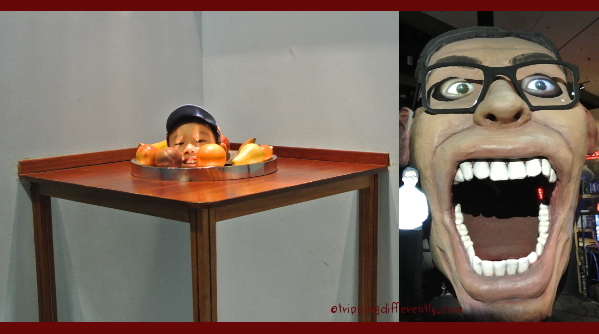 We did do the Human Body Experience, where you enter the giant mouth as food and exit as poo. It was interesting but it smelled (because of the type of latex they used to build the exhibit). Last but not least, allow me to introduce you to Tobias’ and his uncle’s shared pet fish – there are two but could only get a clear photo of one of them. 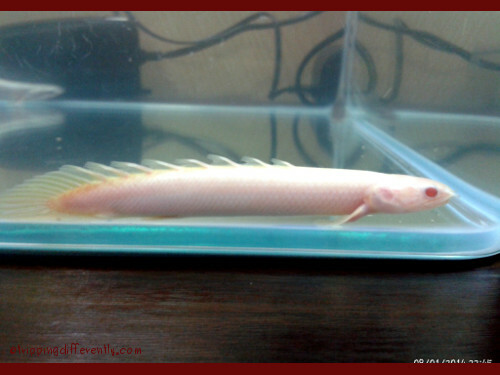 They are dragon fish and there are also 2 cleaner fish which live with them. Of course we met family and friends and had tons to eat in between doing all of the above 😀 We enjoyed ourselves – nuff said! PS: i was wrong about the name of the fish – that one pictured is called Albi. Love the photos – your inlaws have a lovely view! Am selfishly glad to have you back 😀 but glad you had a good time.